When the State of Wisconsin took over responsibility for local cable franchising in 2008, it eliminated much of the support local governments were getting from cable companies to produce local programming. 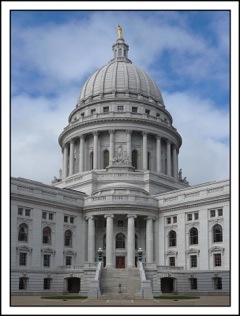 SB 783/AB 1007 introduced this session by Sen. Kathleen Vinehout (D - Alma) and Rep. Gary Hebl (D - Sun Prairie), restores the ability of local governments to decide whether they would like this support and once again asks cable companies to take on more responsibility for supporting access channels. LaTonya Johnson (D - Milwaukee), Evan Goyke (D - Milwaukee), Chris Sinicki (D - Milwaukee), Terese Berceau (D - Madison), Debra Kolste (D - Janesville) and JoCasta Zamarripa (D - Milwaukee). To see their pictures, go to this article on our website. Among the remedies, the bill empowers local governments to assess a dedicated PEG fee on cable subscribers to pay for production equipment and facilities. The legislation requires operators to carry channels without "material degradation" and to list PEG channel programming in the Electronic Program Guide so viewers can find, record and view shows later. Expenses that the current law has shifted to local governments would be shifted back to cable operators such as paying for the cost of transmission equipment. The bill also enables many cities to request a PEG channel from their cable service provider even if they did not have one in 2008. Sen. Vinehout and Rep. Hebl plan to reintroduce PEG legislation next session. WCM will be working hard to see such a bill pass with the help of bi-partisan support.